* According to Lee Geok Boi in the book Classic Asian Noodles, the term is probably a corruption of the Cantonese phrase "kon lo meen", meaning dry noodles. The talented Miss Changy not only cooks, but is an artist! A few months ago, I blogged about this uni student's first event, where we were lucky enough to have the opportunity to sample Sarawak laksa. Since then, she has clearly been busy, not only constructing her own tables, stools, bowls and chopsticks (the latter from pine, jarrah and kauri), but also experimenting with making a bunch of things from scratch, including noodles (using her family's secret recipe), peanut butter, lentil and alfalfa sprouts and even tofu pannacotta from hand-pressed soy milk! We totally enjoyed the fruits of her labour, and also appreciated the tweaks she made for her largest event yet. Rather than cooking in her own home, this time, we were fed at the Morningside cafe The Mustard Kitchen. She got a few helpers to turn it into a slick operation, instead of trying to do everything herself. There was a central station for condiments and cutlery—a bit of audience participation never hurts. And in case you didn't get the picture yet, the food had progressed in leaps and bounds. Condiments, homemade chopsticks and curried roasted peanuts. 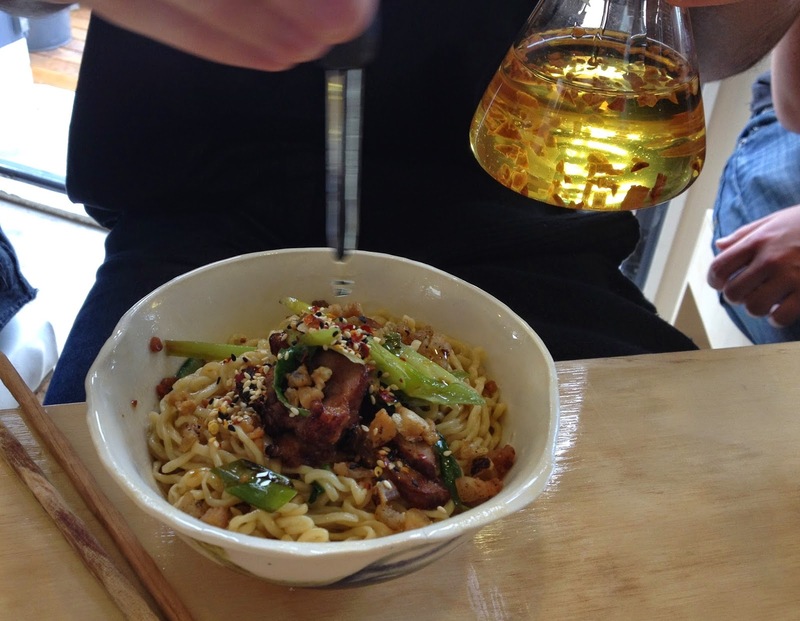 Applying "liquid gold" to our noodles. Having seen the preparation of her noodles, including drying thin sheets of dough on a clothes horse, before putting them through some kind of pasta machine, I expected straight strands of egg noodles, rather like fresh spaghetti. In fact, they were kind of roughly crumpled, all the better for sauces to cling to. No idea how she "jzeushes" her chewy kolo mee, but the end result was excellent. Together with pork, soy sauce, garlic dressing, the mild bitterness of Asian greens and the fragrance of the toasted sesame seeds and dried chillies, this dish was a flavourful taste sensation. 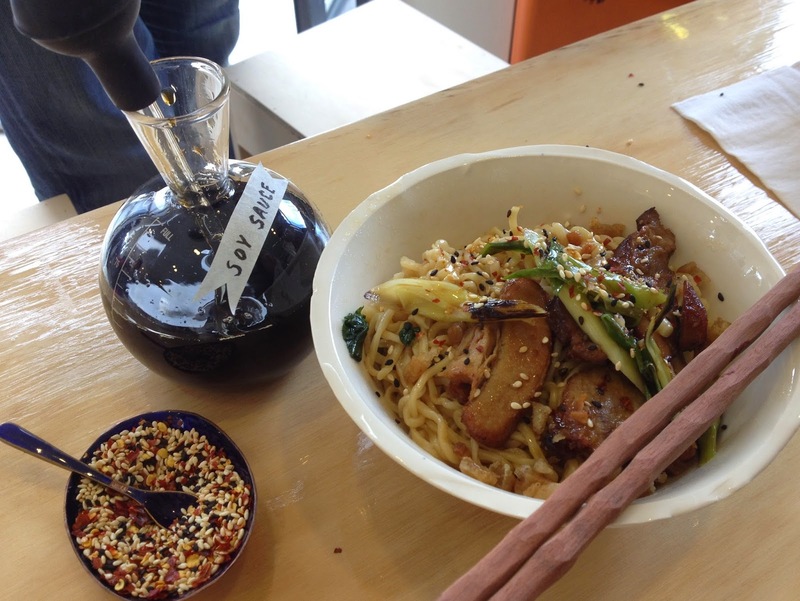 Kolo mee with sesame and dried chilli blend and sauces. Vegetarians were also catered for, with a poached duck egg replacing the BBQ pork. The creamy yolk made a beautiful coating for the noodles, and the meat-eaters were jealous they did not get to experience this too. Vegetarian option prior to the addition of sauce. We would be back for more of Miss Changy's kolo mee in a flash, should she ever offer this again. And we were equally impressed that we ate our meals surrounded by her handiwork, using the unique chopsticks, bowls and furniture she created with her own hands. Bravo, Miss Changy! You are an inspiration. I saw this event too late! Morningside is close to me, I could have walked. Glad you made it, it looks delicious. So impressed with the homemadeness (is that a word?Ok, it's not a word, it was autocorrected to "home madness"). Making your own tables, stools, bowls and chopsticks, noodles, peanut butter, tofu pannacotta. Amazing! Reminds me of my coworker's husband. Not satisfied with just making his own pulled pork, he then made his own tortillas. Furthermore, he built his own tortilla press. How far back do you go? Wah kolo mee in Auckland! Do you by any chance know whether she still serves kolo mee? Very good question - best to ask Miss Changy directly!